Godly like appearance - aloof and yet passionate behavior. His voice actually has a dull hum behind his words making it soothing to listen to him talk. Valhalla's coat is one of unusual aspects, the main coat that houses his markings is that of a Liver Chestnut coloration dappled with cream dots and flecking of white illusion like golden starlights that flicker against his dappled coat. All four limbs are dressed with overflowing flocks of hair from his fetlock down to his hooves. His front limbs hair growth goes from dark liver to light brown and his back legs are dark liver. Valhalla's face and body are flecked with stars and brighter so on his golden head. A head that is a brilliant sheer gold that illuminates. His eyes are pupil less and are shaded from cream white to golden. Replacing his ears are wings that stand up straight against his skull. He does not have a mane but instead sports a regal goatee that starts just before his mandible. The tail that he does have is short cropped and braided in different flows and fashioned with a golden clip that dangles two cyan blue tassels. His tail is a beautiful dark brown mixture of colors with kinks and curls at the ends of the braids that tie them. 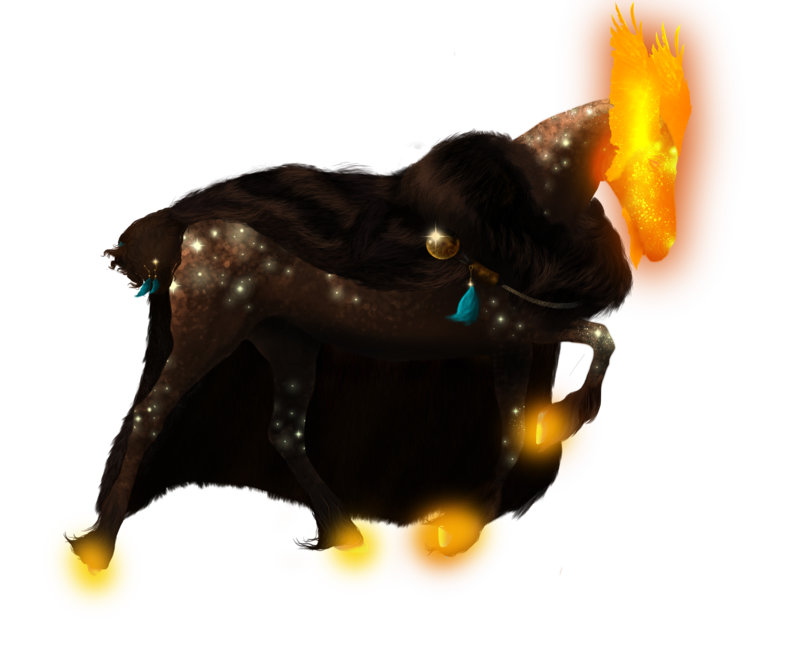 His hooves are smoldering golden color that when agitated they glow just as bright as his face. Most of the time Valhalla can be seen wearing his bear skinned coat that connects around his neck and slopes off his back to knee length. Valhalla has a charismatic personality where many believe that they become purified in a way from their earthy of one's sins and consequence upon meeting him and hearing him speak. He is mostly silent - keeps to himself - and very self-understanding. He becomes passionate about the things of value that he holds dear. He is very smart and at times can be cunning and often more than not aloof. He holds a bit of mystery to his being as not much can be known about him other than he has a rather odd love for life and helping others. Valhall's temperament could be one described as lonely but longing - he often can be found in sheer solitude of his own fathom but also could be seen amongst groups of others in his own species. Some often believe he has two personalities due to the changes in his actions and ways from time to time - but it simply is sometimes the stallion would rather seek solace than the warmth of others near. Long ago, under a moonlit sky - a new mother was awaiting the last push of her firstborn son. A child cloaked in liver and stars. Yes - the very stars in which she laid under had given light to her newest baby boy. A boy she would soon come to call...Valhalla. The year that Valhalla was born was a hard one, not because of his over all family situation within his heard. But because unlike most of his herd - he was the only child born with such looks. This cause controversy over who his father was as the herd's second leader was by eye shot no where near to the extent that Valhalla was in looks or size. As a young colt he was picked on - and even made fun of for his brilliant bright golden skull. When he turned two he had accidentally harmed someone in protecting himself during a challenge fight among st his peers to find his place among st the world of their herd. In shock he had run away from his problems and without paying any attention to his surroundings, he had found himself falling into the black beaches of the Svartr Basalts. When he awoke he couldn't really recall much - and because of his young age - he found himself staggering near the ocean's mouth far too closely. A passerby finds the young and injured Valhalla and takes him in - only for days later to find out just how far from home he had wandered from his herd. When he finally had gotten used to his injured body and began walking again - he couldn't find his way home no matter whom he had asked. Months and then years passed. By the time he was seven years old he had given up finding any sign of his old herd and completely turned himself around. He started to help find others that were lost just as he - He aimed to be better, to never turn his back on someone asking or needing guidance. And so his name had filled the air surrounding the area and the name ' Valhalla ' had become well known. Most years had passed and he decided to leave the tiny area near the black beaches and head west at first, and then east, and then north and south again. No matter where he went - equine and creature alike stared upon his large foreboding appearance. Divine Transcendent Illusion - A light source that is hollow, solid or glimmering giving the user a godly like appearance. In a fit of protection and rage - Valhalla comes to realize he has a transcendent illusion that projected himself with a large ominous glow that while uncontrollable took over his entire body. When it fades or ceases to be used - his body becomes rigid, tired and worn. Sometimes the power becomes so great that it would temporarily blind his sight and senses causing a dull ringing in his ears and a mass sheet of whiteness covering his line of vision. Valhalla starts to become more aware of his powers and finds it is easier to manipulate his power in which to force during times of duress or anger. His power shines brightest when fear or anger seems to fluctuate his emotions - and thus also ranges in visible tones of brightness and glimmer. He no longer strains under the pressure of the usage of his powers but he has lingering side effects in his ears and eyes that range for a few minutes instead of nearly an hour. Valhalla can now use his powers without straining his mind and body to do so - his ears have lost the sensitivity to the bright glimmer and lights that shine from his body and now can navigate his Transcendent Illusions to specific body parts but only for a matter of time before either dimming entirely or flooding his entire body once again. His eyes still hold a slight aftershock reaction but it is no longer disabling him to see or sense things around him. Valhalla can now use his Divine Transcendent Illusions to give him an out-worldly and godly of an aura. Valhalla's Transcendent powers work in a way that causes a divine aura glow around his body but mainly his head at all times. His eyesight and hearing are no longer affected and he can push, limit and use his powers to any and all degree's he wishes. Bright? Dimmed? or barely noticed? He can now manage all formats on how bright to use his Illusions. He can now give an outer-worldly appearance or that of a godlike one. He can blind or show someone 'the way' to go in a time of darkness. Grizzly bear coat with a large metal bearing his crest. and tassles in cyan. Tail adorned in a gold pincher metal also dangling a cyan tassel and braided with a teal blue ribbon.